Hello, EV fans and interested parties! Trish, here. I know I’ve been pretty non-existent on this blog, but I’m finally chiming in to provide my thoughts on my new Soul EV. Further down, you’ll find Ty’s input as well, and a more technical analysis than I care to delve into. I’m going to start this post off with a disclaimer: I’ve never been a fan of Kia. Moreover, I’ve always thought the Kia Soul was ugly as all get out and assumed that they were cheap and poorly made, and that I would never in a million years want one. So when Kia announced their new Soul EV, I was actually surprised to find myself liking what it had to offer; first, on a visual level, and then on a specs level. And then I learned that they would only be offered in compliance states. In other words, not Washington. Sad trombone. But then the 2016 Soul EV arrived, along with the announcement that it would be arriving at Washington Kia dealers this summer. And then they announced that the EV+ trim would be available with a “Sun & Fun Package,” which, most importantly, included a panoramic sunroof. And I was done for. Hook, line, and sinker: Kia reeled me in. On September 19th, we signed the lease papers at Smith Kia in Bellingham, and I drove my new titanium gray Soul EV+ with Sun & Fun Package home. Unfortunately, it was raining cats and dogs, so the sunroof needed to stay closed on her voyage home. I’ve had many people in the EV community, most of whom have a Nissan LEAF, ask what I think about the car. After several months of driving it, I think I’m ready to share some of my feelings about it. Let’s just get this out of the way right now. Obviously, I love this feature. I’m not a fan of feeling like I’m closed-in when in a car, but I also like small cars. 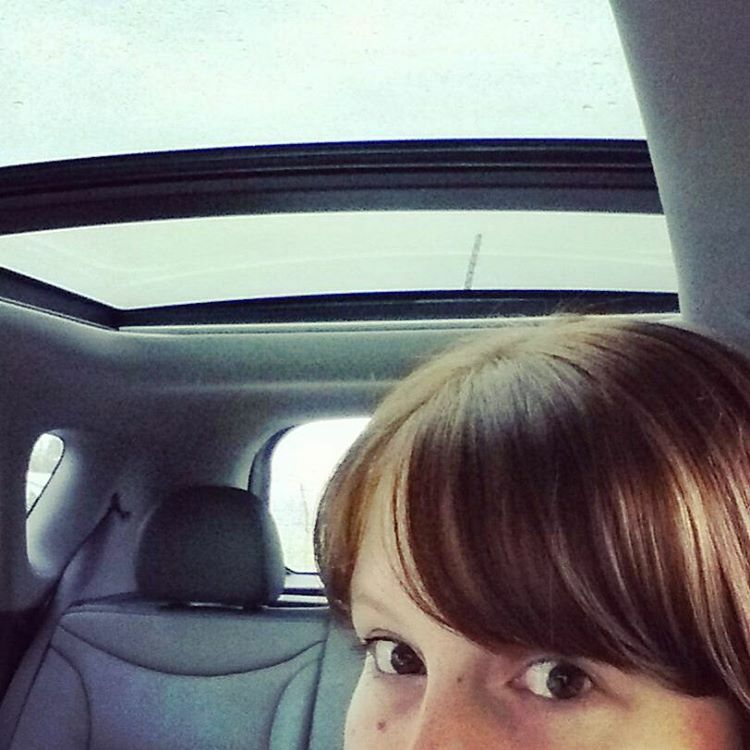 The sunroof lets me drive a smallish car and still have plenty of natural light throughout, making things feel more open. I also hate having my hair blow every which way when my window is open, so I get fresh air and a slight breeze from the sunroof without the tangles. The dogs also enjoy this. It’s not great at high speeds, but then I wouldn’t have my window open at that point, either. Some have questioned added drag from the roof being open, but I counter that any driving I do with the roof open is likely to be putting around town where range isn’t a concern. If range is a concern, the roof will stay closed. It will still let lots of light in, anyway. This is an interesting topic among the EV crowd, and even Ty and I disagree on it: I don’t like driving a car that is obviously electric. That’s not to say I want to hide it; there’s a difference. The reason behind my position is twofold. For one, I’d rather not be a target for ignorant bullies. We get a lot of “coal rollers” in our neck of the woods, and I’m not comfortable with how aggressively they drive around me when I’m in my LEAF. If I can drive an EV and not feel unsafe, then I’ll be happier. The Soul EV has three little badges on it which indicate that it’s electric, but most of these people won’t notice. The car also looks slightly different from its gas counterparts, but not enough that someone crossing paths with me is going to notice, let alone have enough time to blast out a plume of black soot in my face. The second reason is that I’ve talked to many people who would be interested in an EV but hate how so many of the options look really different from their perception of a “normal” car. One could call the Soul EV’s looks into question, but as different as it is from lots of other car designs, it still looks pretty much like the gas Soul; it’s not different-looking solely because it’s electric. 122 design Denmark‘s leading leather chair designer have made sure to give the interior as unique of a feel as they could. Ty has mentioned wanting it to be obvious that a car is electric, so more of the public realize just how “normal” EVs are becoming, but I think there are enough EVs out there to serve that purpose, that I can now go on my own tangent, quietly EVangelizing from my not-quite-as-in-your-face Soul EV. Like the LEAF, the Soul EV has a pretty involved infotainment system. The first thing that caught my attention is the difference in usability. In the LEAF, if you want to scroll down a list of addresses, charging stations, or what-have-you, you have to push the little down arrow and it will bring up the next items in the list. In the Soul EV, you simply drag with your finger, just like on your smart phone. These days, that kind of behavior is so intuitive that I was already dragging to scroll down a list before it even occurred to me that I might not be able to do that. 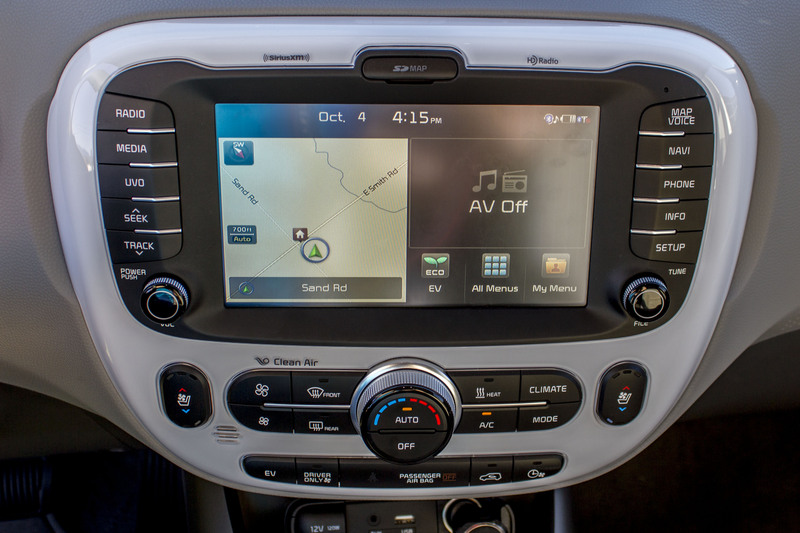 This makes navigating the infotainment system faster and less clunky. This also works with the map, where you can drag your finger around to show the area you want, rather than tap it with your finger multiple times to get it to scroll in the right direction, as in the LEAF. Definitely more user-friendly! For a long time, Ty and I have griped about how we wished the LEAF would let the passenger do things in the menu or with the navigation, while the car is in motion. If you were driving and trying to input the address you want to navigate to, forget about it. I realize that this is a safety feature, but when we drive, it’s always the passenger who’s handling the navigation. The Soul EV doesn’t let you do everything while in motion, but it does let you do much more than the LEAF does. Another feature that I like the idea of, but haven’t implemented yet, is that you can create a custom menu that is accessible directly from the home screen. So if you regularly go several levels deep into the menus to get to one screen or another, now you can simplify that process and tailor the menu to your needs. As I said before, I didn’t expect to be impressed with the build of the Soul EV, but truthfully, I was. 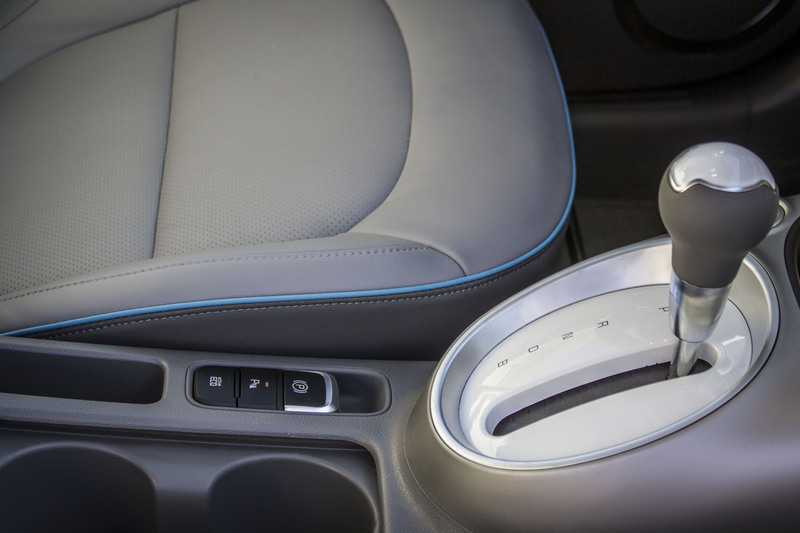 The EV+ trim has leather seats, which are two-tone gray and have a subtle but classy light blue accent trim. My LEAF was an SV with cloth seats, which I thought I preferred, as I’m not really into the leather seats in Ty’s SL. I really like the build of the Soul EV’s seats, though. The driver’s seat adjusts the same as in the LEAF, forward/back and up/down. The plastics used inside are also high quality and feel solid. Driving isn’t much different than the LEAF. The Soul EV has the same get-up-and-go and handles similarly. The steering wheel has three driving options to choose from: Normal, Comfy, and Sport. I’ve kept it in Normal; Sport is pretty tight. I often noticed that the steering wheel in my LEAF was pretty loose and would occasionally wobble around in my lane when I would take a corner too fast. I have yet to experience that in the Soul EV. So far it feels very responsive and even though I sometimes feel like the car is larger than the LEAF, it’s very zippy. The steering wheel also telescopes in addition to tilting, so you have more options for adjusting it to your comfort level. The Soul EV’s regenerative braking is noticeably stronger than the LEAF’s, when in B mode. I’m still re-calibrating my driving habits in order to utilize that more when coming to a stop. I do like that the brake lights come on when you let up enough on the accelerator, so I’m not as worried about someone rear-ending me as I regen. For those who enjoy driving in Eco mode, the Soul EV has that, too. When I first test drove it, I didn’t realize that Eco mode was enabled and was wondering why it seemed to take so much effort to accelerate. I expected the button to be on the steering wheel like in the LEAF, but it’s actually down by the shifter. Also next to that is a button for enabling the parking sensors and an electronic parking brake, like the 2011/2012 LEAFs had. The first time I drove a Soul EV, back in May, I was impressed with the things that Kia had done. I had the impression that they had spent a lot of time driving around a 2012 LEAF and picked out every little thing that could be improved upon, and made sure that the Soul EV did improve upon most of those things. After looking more closely at Trish’s car, I’m even more convinced that this is the case. Kia really wanted to make something that competes well with the LEAF. 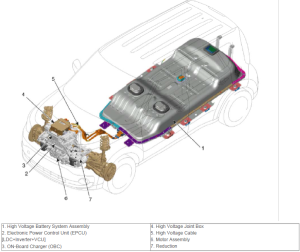 Diagram of Soul EV drivetrain from service manual. The motor in the Soul EV has almost identical performance to the LEAF, at 81.4 kW with 210 lb-ft of torque. Due to the body being less aerodynamic, and possibly other factors, however, it’s not quite as efficient, getting 105 MPGe combined compared to the LEAF’s 115 MPGe. 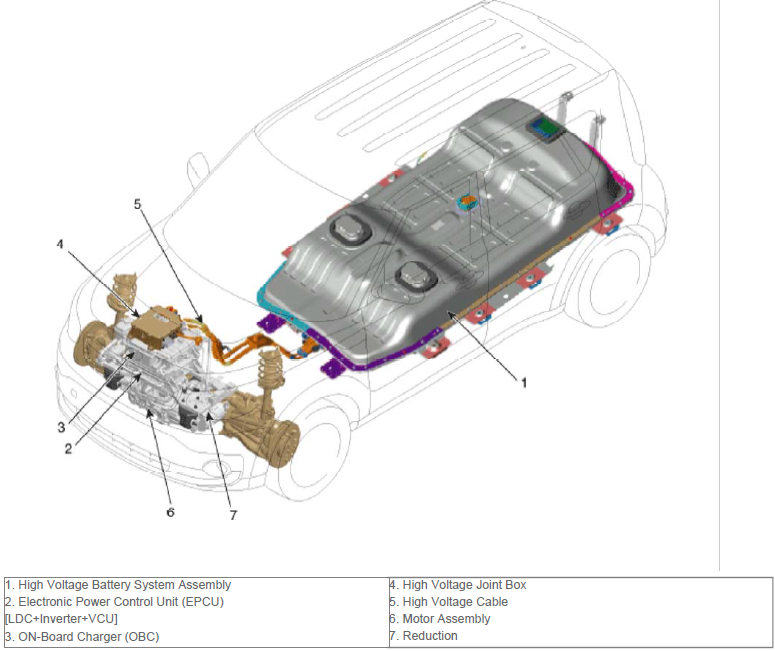 Kia elected to include a larger-capacity battery than Nissan had at the time. The Soul EV comes with a 30.5 kWh battery (27 kWh usable), compared to the LEAF’s 24 kWh battery (22 kWh usable). Kia chose to allow a smaller portion of the battery to be usable in order to help promote longer battery life. Kia is confident enough in this that they include an outstanding battery capacity warranty, covering 70% of original capacity for 10 years or 100,000 miles. The rest of the drivetrain is covered by a warranty of the same duration. This is substantially more than Nissan’s 5-year, 60,000-mile warranty of 70% capacity. The larger usable battery leads to the Soul EV having a longer range per charge than the LEAF. It also allows for faster DC charging (up to 90 kW). (The Soul EV does include a CHAdeMO port, just like most LEAFs sold in our area.) The EPA-rated combined range for the Soul EV is 93 miles, compared to the LEAF’s 84 miles, which was better than any EV other than the Tesla Model S, at the time of its release. Nissan recently announced that the 2016 LEAF will be available in some trims with a 30 kWh battery pack. It will have slightly more range, rated at 107 miles, due to the LEAF being slightly more efficient, as I previously mentioned, but it’s still the same LEAF in all the other ways. Unlike other types of cars, which generate a substantial amount of excess heat which can be used to heat the cabin, electric vehicle motors run relatively cool. However, the motors and their electronics do generate SOME heat and it has to go somewhere. In the earlier version of the LEAF (2011-12, and the S trim today), an electric resistance heater was used to heat the cabin. The motor and electronics were liquid-cooled, just like an internal combustion engine, with a radiator and fan at the front. The resistance heater might use a substantial amount of energy, which would reduce the range substantially, especially in the winter. All LEAFs include air conditioning, which runs on a high-voltage electric pump. In 2013 (SV and SL trim levels), Nissan modified the setup to combine the air conditioning pump into a heat pump. A heat pump works just like an air conditioner, but can “pump” heat in either direction: into or out of the car. The heat pump uses a second radiator at the front of the vehicle to either put heat from the car (when cooling) or get heat to put in the car (when heating). Heat pumps can heat the cabin much more efficiently than a resistance heater, so the range impact is even less. Kia decided to take this a little farther. 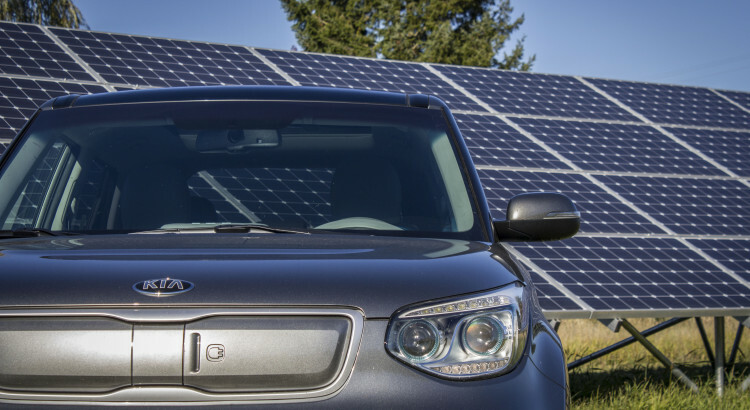 Since the electronics of the car are generating some heat, the heat pump in the Kia Soul EV is able to use both the air and the electronics as a source of heat. As a result, in the winter the Kia Soul EV will be more efficient than a Nissan LEAF. Like most modern production EVs, the battery pack in the LEAF and Soul EV is located under the floor, primarily under the rear seat. The LEAF’s battery is not ventilated; if it’s too hot, it cools only if the outside air is cooler and then relatively slowly, as the battery is quite dense. If it gets too cold, the battery temporarily loses capacity, and only gains it back once heated again by driving, charging, or an increase in outside air temperature. Nissan includes a battery heater in case of extremely cold temperatures. Unfortunately, this lack of ventilation leads to issues when attempting to take a LEAF on a long trip, especially in warm weather. High temperatures can damage the battery and the car will limit power output and input in an attempt to prevent damage. 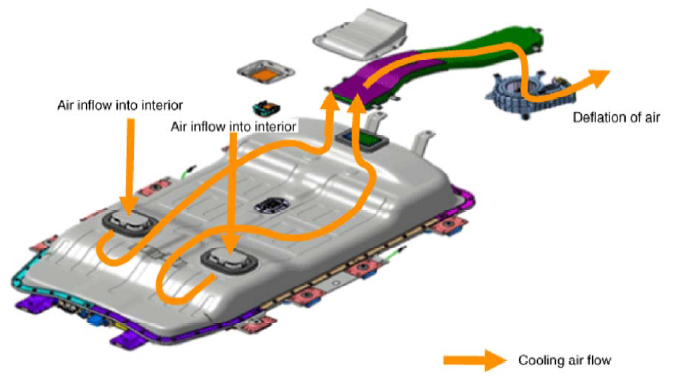 Soul EV battery cooling airflow diagram from the service manual. Kia has implemented a very interesting attempt to work around these kinds of issues. The cabin air, which, as I discussed previously, is heated or cooled using a heat pump, possibly using heat from the motor, is also pumped through the battery pack. 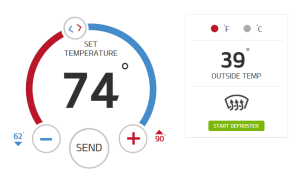 Since the battery works best when it’s the same temperature that humans tend to prefer (about 70 degrees Fahrenheit), it works out that if it’s hot outside, the A/C is running so the battery is being cooled. Likewise, if it’s cold outside, the heat is on so the battery is warmed up. As a result, the Soul EV is probably a better candidate for long distance drives and will likely perform better in the winter, as well. 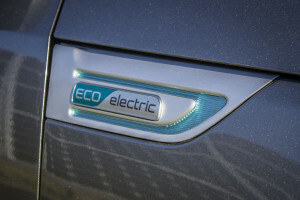 In the US, Nissan and Kia both provide connectivity options for their EVs: Nissan Connect EV (formerly called CARWINGS), and Kia UVO. They both allow you to use a smartphone app or website to get information about your car, like the state of charge, estimated distance to empty, and time to complete charging, plus control some things remotely, like turning on climate control. Battery information on MyUVO website for 2016 Kia Soul EV. There are differences, however. Kia UVO allows you to find the GPS location of the car and show it on a map. Kia UVO also shows the exact percentage of the battery’s state of charge, while Nissan Connect EV only shows how many of 12 charge bars the car has. Kia UVO displays the ambient temperature at the car’s location, and which doors are open, closed, or locked. When initiating a charge remotely, Kia allows you to specify whether you want to charge to 80% or 100%, right on the app or website. They also allow you to configure the charging schedule (timers) this way, instead of having to sit in the car and configure them on the dash. Setting the climate control for a 2016 Kia Soul EV with the MyUVO website. When you wish to pre-heat or -cool your car, Nissan allows you to turn it on immediately or at a specific time, using a temperature pre-configured in the car. Kia allows you to choose, when you make a request to turn on climate control, what temperature you want and even whether you want the defroster on or not. It also lets you configure the climate control schedule. There are a few places where the LEAF still has an advantage over the Soul. Obviously the 2016 LEAF is available with slightly more range per charge. The Soul has less cargo space and leg room in the back seats, although the trunk space is taller so you could probably fit some larger things in there that you can’t in the LEAF. The Soul fits better in the garage, though, as the LEAF is a whole foot longer (but 1 inch wider and 2 inches taller). One feature that we’ve found to be lacking in the Soul EV is the ability to pre-heat or -cool while the car is not plugged in. If you have plenty of battery charge, it’s very nice, with a LEAF, to order the car to start warming up for you while it’s out in the parking lot and you’re finishing up in a store. But that is not an option for the Soul EV. This is probably the most annoying problem we’ve had. In addition, there appears to be no way to change the dash to display km/h instead of mph! Since we live right next to Canada, this is likely to annoy us at some point. From searching online, it sounds like Soul EVs that are sold in other countries do have this ability, but the option is simply not there in ours. Overall, we both really like the Kia Soul EV. It’s got great looks and outstanding features. We’ll definitely be using it for our road trips in the future, and we’re very happy to have replaced one of our Nissan LEAFs with a Kia Soul EV. Let us know in the comments below what questions you have about these cars and we’ll do our best to answer! Great article! It’s great hearing from the perspective of a Leaf owner their differences. I am curious what the lease payments are like though? $235/month on a 2016 Leaf S with zero down is what Ray at Magic is quoting for VPP eligible customers. Lease deals change from month to month, plus we had a large down payment which reduced ours a lot, so it’s difficult to make a price comparison on lease payments. However, on the MSRP side of things, the fully-loaded LEAF SL is the closest thing to a Soul EV+, and still has a lot of the differences noted here in our post. Since the Soul EV+ is only about $1,000 more, I think it’s a great deal. Thank you for the detailed and easy to read comparison! I was going to say, as far as gripes about a car, that’s pretty low in importance! Trish, thanks much for the very information review! 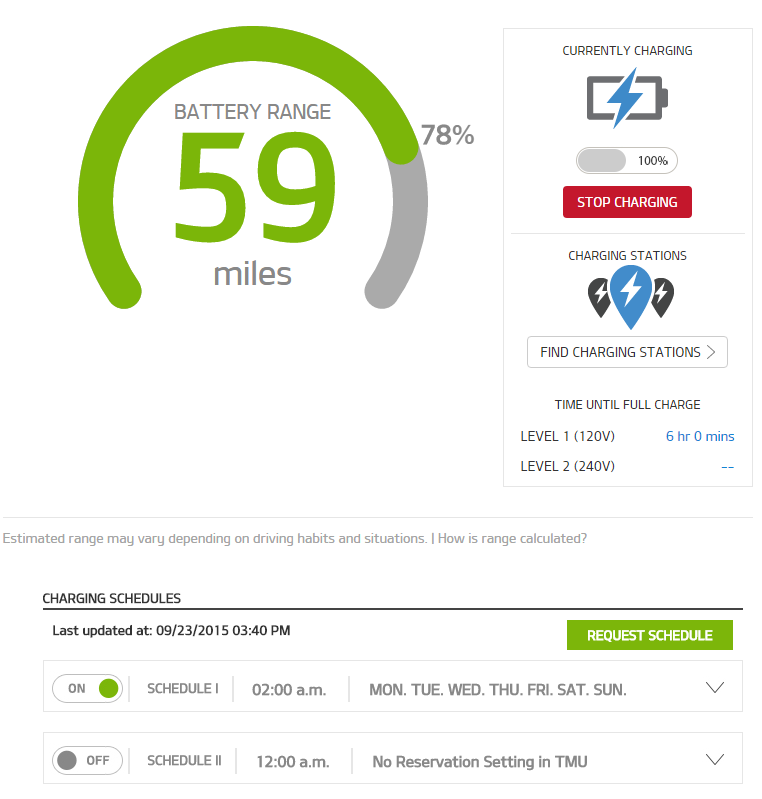 I just bought a Kia Soul EV+, and I am wondering if you know if it is best, for battery life, to generally limit the charging/discharging of the battery such that the battery generally remains, on the low end, at 20-30% of full charge, and, on the high end, at 80-90% of full charge? I do realize that it is best not to supercharge the battery above 83% (as stated in the owners manual), but I so far am only use slow, home charging options, where the owners manual references 100% as the maximum charge). Battery life management is pretty much the same for all lithium-ion batteries. In general, the idea is to avoid extremes for long periods of time. For example, don’t leave them fully charged or fully discharged for long periods of time (weeks). Fortunately, the car actually will prevent you from reaching most extremes on the battery. For example, when a Soul EV says it’s 100% charged, it’s not actually 100% charged — it’s somewhere closer to 90%, based on our estimates (compared to a LEAF which actually does charge to 100%). This means even if you did leave it for weeks at “100%” according to the car, it wouldn’t be particularly damaging to the battery. Quick charging is also not particularly bad for the battery, it turns out. It can be bad if you do it many, many times per day, or on a very hot day, but doing it once or twice a day will generally not be harmful. It also doesn’t hurt to do a quick charge to 100%, except the Kia Soul EV will stop at 83-84% automatically (you have to reconnect to resume). Heat is particularly hard on lithium-ion batteries. Kia put the battery ventilation system in the Soul EV, though, which is meant to help with this, so it can try to keep the battery cooler than it otherwise might be, which will prolong its life. I hope this is helpful. Let us know if you have any more questions! I am wondering what you have found the range of the Soul to be when used mostly for freeway driving. I have a 2013 Leaf SL. I tend to drive about 70-75 mph on the freeway. (I average 3.6 kwh.) So, I can go roughly 60 miles on a full charge in moderate weather. My lease is almost up, and Nissan is trying to get me to buy a new Leaf. I can get better range with either a 2016 Leaf or the Kia Soul EV+. 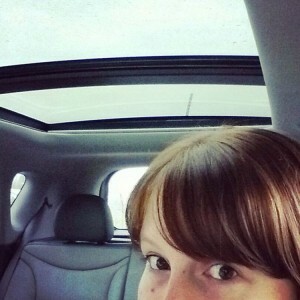 The one thing I miss is a sunroof. I am weighing storage (prefer the Leaf’s), aesthetics (I prefer the Leaf but don’t mind the Soul), features (Soul has the sunroof! ), comfort (don’t really know), and range. I live in the Sacramento area, which can be cold-ish in the winter and very warm (90s-100s) in the summer. Since you have both, what are your thoughts. Thanks for the excellent question. Since the Soul EV isn’t as aerodynamic as a LEAF, and this is much more of a factor at high speeds, the Soul EV suffers a bit more than a LEAF does on the freeway. However, of course, it has a larger battery, so its range would definitely be more than your 2013, but slightly less than a 2016 LEAF SV/SL. At 70-75 mph, I would expect the range to be around 75 miles from full to empty, compared to a 2016 LEAF which is probably more like 85 or 90 miles full to empty at that speed. The Soul will definitely fare better in the higher summer temperatures because it can cool the battery with cabin air while you’re driving, which is good for your capacity at the moment and longevity of the battery. If you’re interested in checking out the comfort level, definitely go to a dealer and take one for a test drive. I think you’ll be very happy with what you find. Definitely let us know if you have any more questions! Thanks for your review. I have a Leaf and have enjoyed it and had zero issues. I’m thinking of the Soul EV now but apparently the 2017 Souls will also have more range. If I wait I get more range but if I do it now I get great lease rates as KIA will lease me a EV+ for like $200 a month with $2k down for 36 months. Right now I’m trying to decide how much the extra range and waiting six months is worth to me. This was an extremely informative article. We are beginning the electric conversion with first a Merc B class for my fancier, better half. For me, it was down to a Leaf or Soul EV. I was leaning towards the Soul but needed the extra push to be definitive. I was hoping to find a household of REAL USERS that had both and could review side by side. This was perfect. THANK YOU! Same boat as Matt, except deciding between a B-Class and a Soul EV+ to replace the Volt coming off lease. HATE GM’s efforts in the state legislatures to decimate Tesla; they’re horrific, despite the new Bolt being so compelling, at least on paper. Have a 3 on order; hoping the car I lease (B or EV+) goes to the wife when 3 is available, and we replace our gas Subie permanently. Article got me thinking about the Soul again. Hey Aaron. I did end up leasing a 2016 Soul EV+ a few weeks ago and can give you some of my impressions with both the B class and the Soul. Our B is a ’14 but from what I’ve read any updates to ’16 are minimal from our year. From a vehicle to vehicle comparison, there is something about driving the Mercedes that puts a smile on my face. I love being in it. It feels solid, heavy (it is actually 700lbs heavier than the Soul) and more substantial yet feels light on its feet somehow. I prefer the Benz regen system to the Soul without question. The Benz feels much bigger than the Soul than it actually is. I like the large and simple analog dash too for some reason. It just seems more pleasant than the digital displays of others. From an EV to EV comparison, there is no battle here. It’s Soul hands down. The Benz app is a joke. It’s not even an actual app it’s a webpage. Kia’s UVO app has a glitch from time to time but is all around much better and has many more features. The B has no visual charging status indicator. I literally have to use the sucky app or go turn the key. And even then it takes 3 steps through the infotainment setup to get to the battery percentage indicator because the juice gauge in the dash is analog. I HATE this. The Soul has 3 LED top dash status lights that blink while charging and go off when it’s finished. The Benz has no DC quick charge port. UVO with a touchscreen is far superior to the COMAND system. As before I prefer the regen braking in the Benz because it has really good bite and seems much easier to adjust to than the Kia for one pedal driving, BUT the system does not activate the taillights like my Soul does in it’s most aggressive mode when slowing. To me this is a major safety issue and an embarrassing oversight. Oddly the Soul has more options than the Benz too, like ventilated cooled seats, heated rear seats, steering wheel and power folding mirrors. It has an optional panoramic sunroof too. The range and miles per kw is far better in the Soul because even though the battery capacities are nearly equal, the weight difference drastically affects range especially at higher speeds. To boot, Kia did a better job at HVAC efficiency both for the cabin and mechanical components with the heat pump, battery heater etc. (see above). Even still I’ve got over 100 miles on a charge in both with more careful driving in the Benz. Finally, if you’re considering a Soul lease in the short term I would jump soon. The Kia lease incentives are available until September 5th or 6th I believe and they’re insane. Keep in mind I wanted to purchase because I knew I would blow through the annual mileage in a lease. But in the end it was almost $4000 cheaper to lease and buy at the end than finance. To Finance – $34,500 purchase price with 0.0% for 66 months. the built in acquisition fee but it wasn’t any more than $500. I’m not sure what kind of deals Mercedes might have at the moment. I bought the Benz used 2 years old for $22,750 with 13K miles. In spite of my love for driving the Benz, I think overall the Kia is the better buy. Just my two cents. Good luck either way! Great article .. I have a question regarding the Kia Soul EV I purchased in June of this year. For the first few weeks, the battery would charge and the range would be approx 150 Km (93 miles). Then it dropped to 140 km and now am only able to achieve ~130 Km (80 Miles) . I was on a home outlet charger for the first few weeks and since I have a purchased a Leviton EVB 40 charger. Is the drop in charging “volume” normal or should I be looking into this through the dealer? Thanks in advance for any comments / recommendations. The remaining range displayed on the dash of the Soul EV (or the LEAF) is an estimate based on your recent driving performance. For example, it might take the last 20 miles of driving, see that you used 5.4 kWh, and calculate that you got 3.7 mi/kWh. It then looks at the usable energy in your battery, say 26 kWh, and multiplies that by 3.7 mi/kWh, to guess that you have 96 miles of range. If you have recently had decreased driving performance, such as by colder weather (requiring more energy for heat) or driving faster, and/or temporary decreased battery capacity (usually caused by cold), then the estimated range when you’re fully charged will be decreased accordingly. By the way, this estimated range remaining is often called the “guess-o-meter” in EV circles, or GOM for short! Generally it’s regarded as a very rough estimate and shouldn’t be taken too seriously, although the Soul EV seems to do a bit of a better job of guessing than the LEAF. This will generally occur as both the temperature decreases due to fall/winter and the computer adjusts to your driving style. Remember it is just an estimator. Cold weather will affect your range as will your driving style. The computer tries to compensate as such. It’s like the “miles to empty” indicators gasoline powered vehicles have as part of their trip computers. That will vary from driving style to weather as well. Similar thing. This is a great comparison! I have a 2015 Leaf and lease is up in end of 2017. I am shopping around to hopefully find something with better winter highway miles and with better winter handling as I am in Wisconsin. I have noticed lately that the Leaf feels like is is blowing all over the road and almost hydroplaning. Pretty scary when you live in a winter wonderland. *Anyone out there driven both the Soul EV and the Leaf in snowy/cold climates? Any preference for handling? I only know how my Leaf performs and they both look to be the same weight. I also have been challenged in the winter with highway driving, and on most days my remaining battery is 10 miles or less. And sadly this is sometimes after driving most of the day without the heat on to save charge (this is really hard to do when it is 30-40 degrees!). I question whether the full electric is the right car for me in the northern climate and since I live about 25 miles from my work. Would love a Tesla for longer range, but the price jump is so substantial. 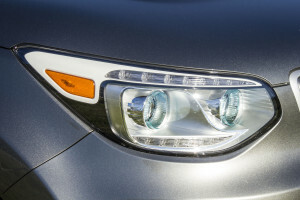 Anyone have a comparison on the Soul vs Leaf for longer highway travels in the winter climate? We haven’t had any substantial winter weather since Trish got the Soul, but I would wager that the Soul has better range performance in the cold. I say this because of a couple factors. First, the battery heating mechanism: keeping the battery warm with cabin air will keep the range from dropping due to a colder battery. Second, the Soul has a much more advanced heat pump system than the LEAF does, being able to pull heat off the motor and electronics, which means it’ll work better in colder air to heat the cabin. This will save you a ton of energy when it’s cold and improve your range. For your LEAF, a couple cold-driving tips to increase range: Use the seat and steering wheel heaters and turn down the air temperature. Also, wear gloves. And drive slower, obviously. I personally set the heater on Auto at 62 degrees and use the seat and steering wheel heater to keep me warm enough. I hope that you have an SV or SL, so that you have the heat pump, which is much more efficient at heating the cabin air than the conventional electric heater in the S trim level (and 2011-12 LEAFs). Thanks so much! And yep, I pretty much drive 65 or slower, with the seat and steering wheel heaters on, and covered in gloves/hat/coat! I just laugh at myself because i feel like I am bundling up to go sledding/am uncomfortable, and I am paying for a premium car! I’ll try the lower temp…and see if that helps. Your Soul feedback was very helpful – and more than I have been able to find just reading through the car brochure. Seems like that may be the better fit next year. We unfortunately don’t have any available in town for test drive yet…hoping that’ll change soon. I ended up taking over the lease on a Tesla -powered MB B Class Electric Drive. LOVE IT. ❤️️Plenty of range, and all the amenities I want. I drove the EV+ twice, and couldn’t get over the poor stereo (actually a thing for my commute) and the lack of combo I wanted (silly, but I wanted sun and fun in blue or black with red, and no dice on either combo. The BENZSLA feels more substantial, despite its range. I’m very happy with it for 18 mos. ( another consideration) until my Model 3 comes in. I just picked up a base model 2016 Kia Soul EV for $150 a month (36 month) and 2000 down in Portland, OR. My last lease was a Volt and I was planning on getting a Bolt. However, got to sit in one at the LA autoshow and was not impressed with the interior. It is not as cramped as the Volt but not as much room as the LEAF or Kia Soul. The cost is also much higher (lack of incentives), limited availability, and more range than I need. Another + for the Soul is the cargo area is more reasonable to put a larger dog in as the the aft door is not sloped like a LEAF. Looks like it will be possible to take 2 adults, 2 kids, a yellow lab and enough luggage for at least a couple days on the coast. Another tip is if you have an earlier model 2016 Kia Soul EV (maybe even 2015) you can upgrade the software on the SD card to add Apple CarPlay and a host of other improvements (All free and takes about 2 hrs). The link for this is on the Kia website. This adds good integration to Apple maps, voice to text for messages, etc. I believe it also supports the Android equivalent too. Maybe they will eventually allow climate controls while unplugged via software update…. I am on the list for a Tesla 3 and the EV cars are getting so competitive I think the primary draw in 2018+ will be Tesla’s autonomous driving capability. A highly informative comparison with lots of very useful additions. Your comment about the Soul EV being better than the Leaf for a large dog is of particular interest to us as we have a GSD/Husky crossbreed. At present she travels in the boot of our Subaru Forester but being a 1999 model we only get 25-26 mpg driving locally and only around 29 at 70 mph on motorways. The ability to accommodate our dog at minimal monthly cost has been a major factor when looking into getting an EV. We cover about 7,500 miles per year but less than 1,500 of this is non-local and having looked at charging locations using Zap-Map I’ve been able to check longer trips would be covered by motorway/main road quick charge points with home charging at the start to help minimise charging costs. All local driving would be covered by home charging. Hi, Thank you for the informative review. The coments provided made me feel better about leasing my new 2016 Kia Soul EV in January 15th 2017. I got a special deal in Dublin CA for $225 including taxes payment with $500 down and 10,000 miles a year. That plus the $5500 incentives my local and state government will make my Kia a very affordable car for the 3 years. I also leased a 2014 Nissan Leaf for 3 years that I will be returning to Nissan in February 2017. I leased the middle of the line with lots of options installed. The Nav system was useless on my Leaf and the app stopped working for a few months. I really liked my Leaf because the way it drove, it feels like no other car I ever driven. I even considered buying it but Nissan stopped the buy out incentives a few months before my lease ended. I decided that getting another Leaf was no longer an option so I started looking at the other EVs. I settled with the Kia Soul EV because of its looks, the larger battery and the better infotainment system. I still believe the car Nav systems are useless but my Kia came with the option of updating the infotainment to the Apple Car Play and Android Auto for free. The update is a bit tedious but it worked. That is by far the best feature for people that like to link their smart phones with their car to make the infotainment system much more useful. My wife and I are very happy with our decision. Now we have to wait for the Tesla Model 3 and see the cost and options to consider it as well. I hope that the Federal and Local incentives are stil available when the Tesla Model 3 is ready. Thank you for this amazing info. As of December 15, 2016 I am a happy new Kia EV Soul+ owner! I appreciate all your tips especially about adding Apple CarPlay for free. You can probably tell I haven’t opened the manual yet. Ty, you should be in public relations for EV cars! You are so knowledgeable. As an energy healer I am so excited to see “energy flow” on the dash. Thanks for the super article. I just got a 2016 Leaf SV and have a few comments. The 100+ range seems to be realistic in that I get 50+ using less than half the battery. I find the touch screen and menus to be OK. Probably improved from the earlier versions. The no charge to charge program is nice, but so far I mostly trickle charge at home at night. I think the Soul seats are more comfortable, but that has to be personal. The Kia seemed a bit darker than the Leaf, so the sunroof would be a big plus. The Soul looks significantly bigger, but is actually a foot shorter! So far the only things that I dislike about the Leaf are the massive A pillars beside the windshield and the somewhat dim low beams. Great review. I would add that the small overlap front collision test by IIHS is poor for the Leaf but good for the Soul. Also, the Soul is a bit wider in the rear seat, by 1.5″, which makes it easier to fit three kids and their car seats in the back. Also, the rear seat door and high roof make it easier to place an infant car seat in the preferred middle position. These were among the reasons we chose the Soul over the Leaf and we’ve been quite pleased with it for the last half year. P.S. You can update your software to support Apple Carplay and Android Auto software – just download the update from the website to an SD RAM card and plug it in and select update.